Tragedy struck one night in Sept 1983 and the MBCL hall was destroyed by fire, the work of an arsonist. This was a devastating blow to south end residents and extremely discouraging to League members who had worked so hard to provide a meeting place for the community. 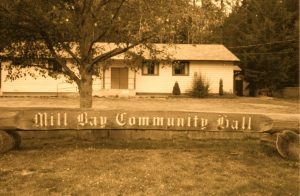 Not giving up and led by President Gladys Gordon and Vice President Ian Balding the Mill Bay Community League undertook a major fundraising campaign to build a new community hall in the same location. 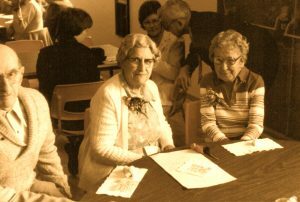 Over the first five months of 1984, a tea and bake sale, a dance, a wine and cheese party, a giant garage sale and a big bingo night provided needed funds. 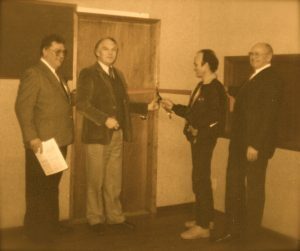 Thanks to the contributions of many businesses and individuals in the area, the new hall officially opened on June 3, 1984 less than six months after the fire that destroyed the first MBCL hall. Ian Balding supervised the one day assembly of the pre-fabricated building which was twelve feet wider than the old hall, had more accessible washrooms, and was more energy-efficient. The making and installation of the log sign for the hall was overseen by Obie Olson. However as community use of the building grew, more was needed and on February 6, 1990 an addition to the hall was officially opened. This added a conference room, small bathroom and a storage closet as well as a much needed kitchen and two large bathrooms. The MBCL Hall and the Community League itself have undergone many changes over the years and will continue to do so with the support of dedicated members and volunteers whose efforts make a better community for all. Please put MBCL membership form here. 1912 saw Mill Bay’s first car, a chain drive Russel, owned by R.W. Frayne. Mr. Frayne could often be seen filling up with water at the horse trough (later changed to the present Rotary trough) before venturing up the Malahat.